Let me give you some context. 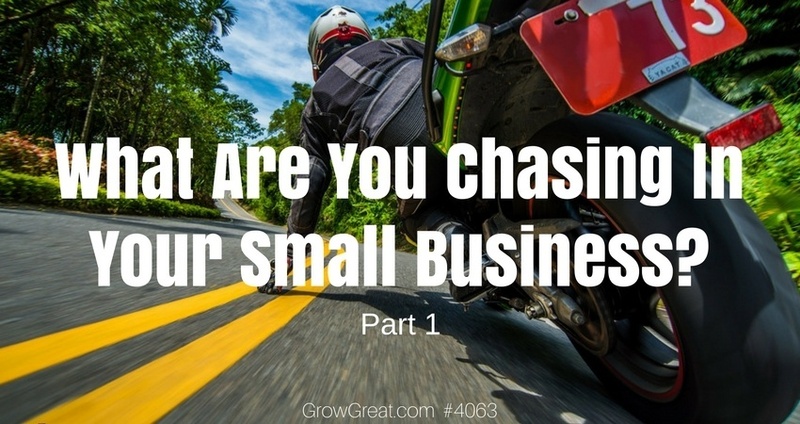 As small business owners we’re constantly chasing some things. What we chase may differ depending on where we are in our business at the time. What we chased last year may not be exactly what we chased last year. Some small business owners chase cash, but they chase it harder when payroll is rolling around. Some small business owners are merchants and they sometimes chase products, merchandise. We can get into a sales slump and find ourselves chasing customers. By chase, I mean “pursue.” We’re hopefully pursuing things that are worthwhile. Today’s show is part 1 and we’ll talk about a number of things in future episodes, including some things we chase that maybe we should avoid chasing!